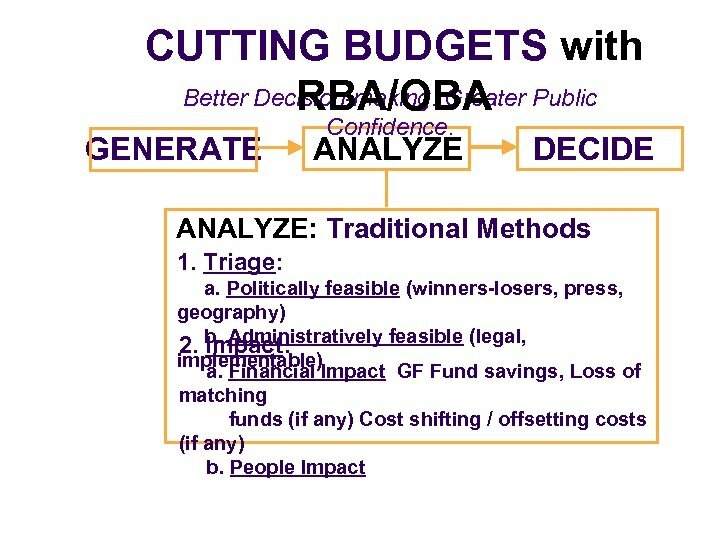 CUTTING BUDGETS with Better Decision-making. 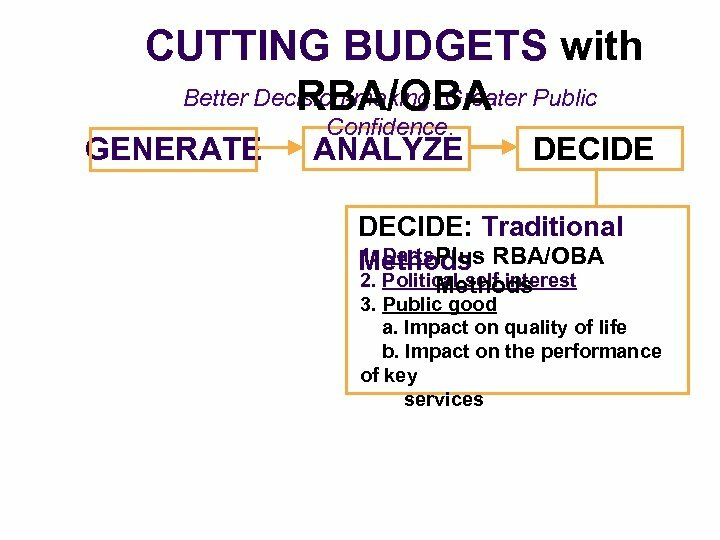 Greater Public RBA/OBA GENERATE Confidence. ANALYZE GENERATE: Traditional 1. 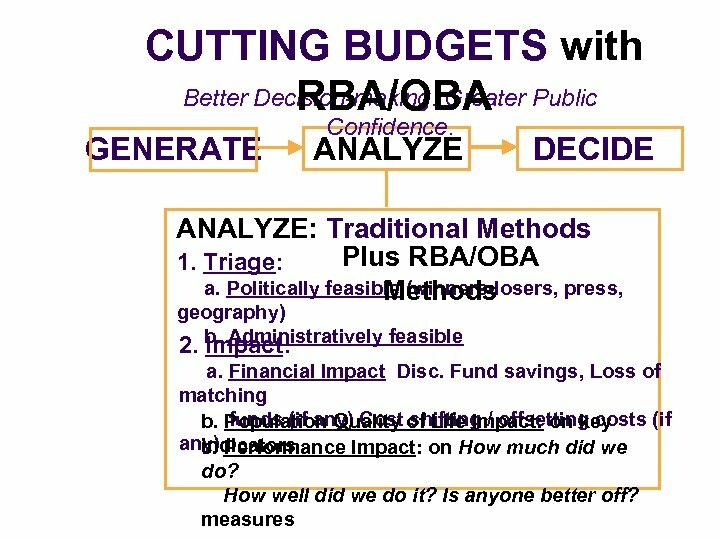 Darts Methods Plus RBA/OBA 2. Across the board x% GF cut (w buy. Methods back? ) 3. 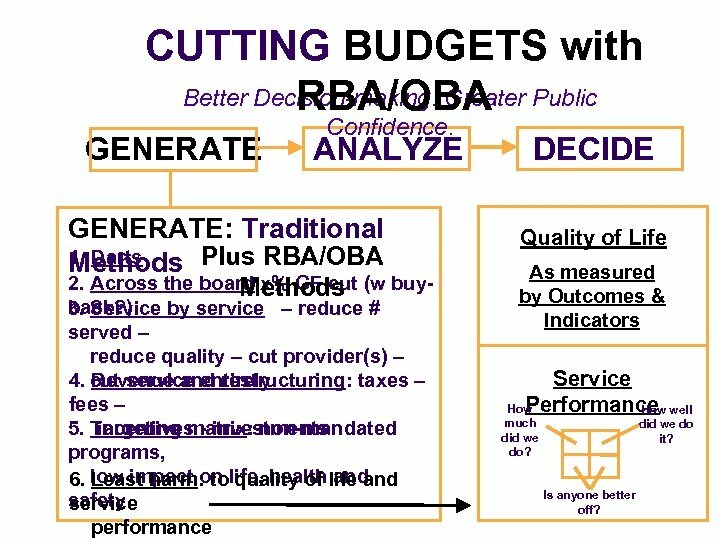 Service by service – reduce # served – reduce quality – cut provider(s) – cut service entirely 4. Revenue and restructuring: taxes – fees – 5. 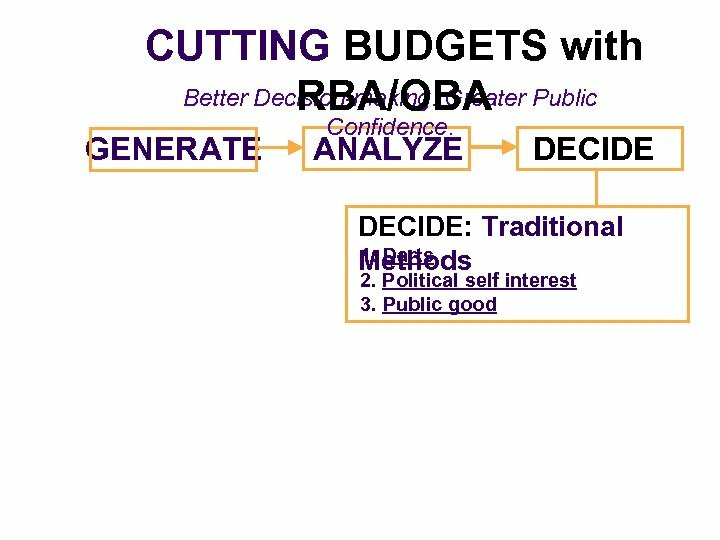 Targeting matrix: non-mandated incentives - investments programs, low impact on life, health and 6. Least harm: to quality of life and safety service performance DECIDE Quality of Life As measured by Outcomes & Indicators Service Performance How well much did we do? did we do it? Is anyone better off? 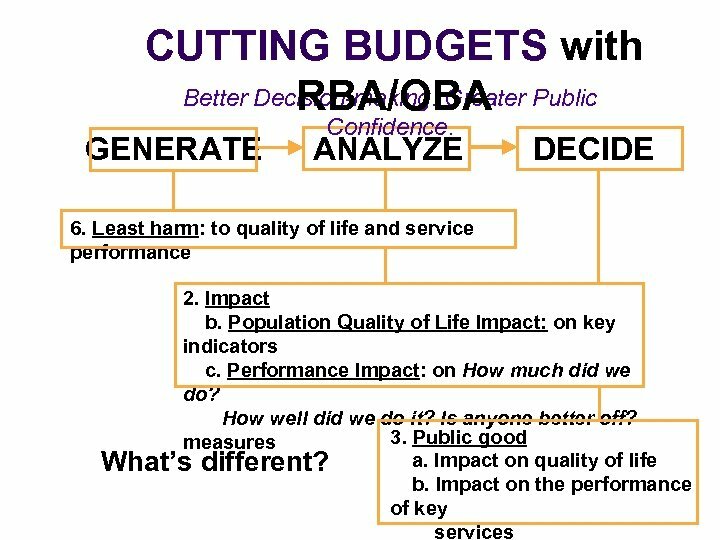 RBA/OBA Least Harm Cutback Exercise 1: POPULATION Least harm to POPULATION quality of life (Population Accountability) 1. Identify a population result/outcome to which your organization most directly contributes. (e. g. Healthy People, Sustainable Environment, Children Ready for School) 2. What is your organization's role in contributing to this result/outcome? 3. What do you do that causes the greatest contribution? 4. What do you do that causes the least contribution? (Least harm cut candidates) 5. 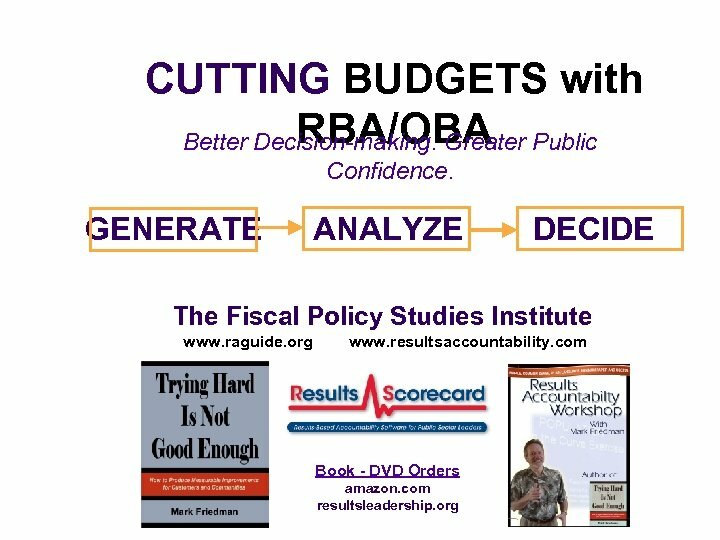 How could you change the way you do your work so as to make the same, or close to the same, contribution with less - Time: 5 minutes for each resources? (Least harm cut candidates) question - Record answers for each question. 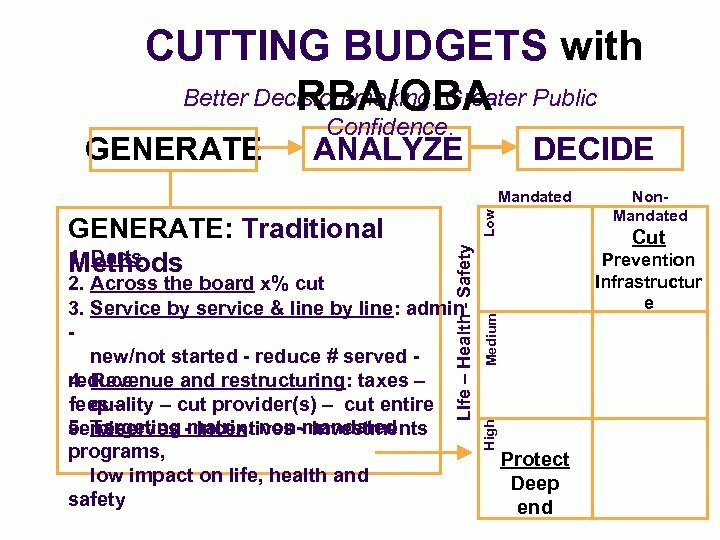 RBA/OBA Least Harm Cutback Exercise 2: PERFORMANCE Least harm to CUSTOMERS' quality of life (Performance Accountability) 1. Identify one service. 2. Identify the primary customer group. 3. What are you doing that is most effective in improving the lives of your customers? 4. What is least effective? (Least harm cut candidates) 5. How could you change the way you do your work so as to make the same, or close to the same, contribution with less resources? (Least harm cut candidates) - Time: 5 minutes for each question - Record answers for each question.